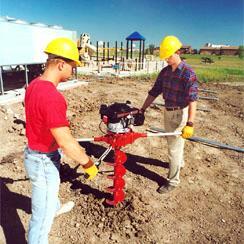 AUGER CAPACITY 2 INCH DIAMETER UP TO AND INCLUDING 18 INCH. Clutch: 3" diameter all-metal automatic-centrifugal, slips on overload. * Please call us with any questions you may have about our auger 2 man power unit with one bit in Kingsport TN, Johnson City, Elizabethton, Rogersville TN, Gate City VA and the NE Tennessee, SE Kentucky and SW Virginia Tri-State Area.